It's pretty hard to believe that I've reached 3500 blog articles as of yesterday. Who would have thought that I'd find that much material and opportunity to work with as a blogger? Not me when I started this crazy thing a decade ago. In any case, this actually is blog entry 3501, so let's roll the odometer on this blog to a new high and keep the thing going! I have a number of things I'm working on to update the blog's look. For ten years, I've held on to the same header image at the top with all the outdated NHL logos, and I'm working on a new one to make sure that's updated. I haven't quite found anything I like yet, but being picky is good for the look of this blog. As you know, this blog isn't just an NHL blog, but the original setup worked well when I was just talking about the NHL. That focus has changed, so the image at the top of this page will reflect that evolution. I'm also going to revive HBIC radio with a monthly theme of shows now that we have five years of radio shows to peruse. Each month will reflect a handful of interviews done with guests who have appeared on the show within those specific themes for your listening enjoyment. It's free hockey chatter all day long on HBIC from The Hockey Show. If you're not listening, you should be! Finally, I really hope that more of you, readers, want to write and submit articles! I'm one voice who blabbers on about hockey whenever I can find the time in my somewhat-busy schedule, so I welcome all article submissions for publication! Maybe something amazing is happening in your community with a hockey team. Maybe you know of a player who is going out of his or her way to grow the game or help a charity. Maybe you just want to a soapbox where you can rant about the dumb moves your team makes. If this interests you, write it out, compose an email, and send it to me here. I'll give it a read and it will be posted or I'll respond with some comments! There's nowhere to go but forward from here, so let's press on. I don't know when this will end and I have no idea what the future holds for this ol' blog, but we're in far enough now that stopping the momentum of this site would be a mistake. Thanks for reading, folks. I can't tell you in words the amount of gratitude I feel towards you for making ten years and 3500 posts seem like a blink of eye. I'm not sure how many independent, non-affiliated blogs can claim 3500 posts as a benchmark of success, but I wouldn't have been able to get here with your support. So thank you. The annual circus on the two major sports networks in Canada will happen on Wednesday. 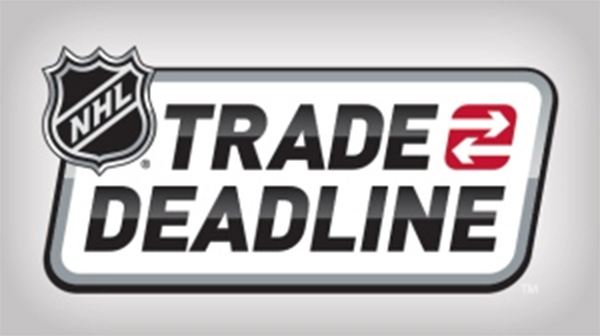 The NHL Trade Deadline used to be the day where most NHL GMs woke up, looked at their rosters, and decided to tinker and tweak until the deadline arrived. It appears, however, that early birds are starting to get the worms even earlier in the week in recent years as the key names who could be moved seem to avoid the deadline insanity by being traded prior to the Trade Deadline day. This year has been no exception as a couple of big names were moved today as we inch towards NHL Trade Deadline day on Wednesday. With respect to TSN whose graphics I am pilfering for these deals, here are my unabashed thoughts on the big names who have moved deals as of this article's writing. Dean Lombardi has never been afraid to make a splashy move when it comes to improving his team, and he may have the best American netminding duo since the 2014 Sochi Olympics with Bishop and Quick in the fold. With Quick having missed the majority of the season with an injury, it was Peter Budaj who has kept Los Angeles in the running for a playoff spot. The thanks he got from Lombardi was to be sent to the Lightning as part of this deal. Going forward, Bishop and Quick will share duties, but one of these two men will not be a part of this team once the playoffs are over. The question for Lombardi is who do you keep? Let's be honest in saying that Lightning GM Steve Yzerman was going to make this move whether the team needed it or not. It didn't matter if the Lightning were going into the playoffs or not as Yzerman has a number of key players and restricted free agents he has to sign and Bishop's salary was just too much. Secondly, the expansion draft likely would have seen Bishop plucked from the Lightning roster anyway, so getting something in return for Bishop was at the top of Yzerman's to-do list. Peter Budaj is a very serviceable goaltender who has shown he can play big minutes this season, and he'll solidify the goaltending position as the Lightning enter the playoffs. Erik Cernak is a serviceable defenceman, but he's not going to blow the doors off anyone with his play in the coming seasons. The real key here is that the Lightning got something for a guy who they would have almost assuredly lost in the expansion draft while opening up $5.75 million of cap room for next season. That's a heckuva play by Yzerman, and he still has the option to re-sign the affordable Peter Budaj if he so desires. I'm going to give the nod in this trade to Yzerman simply because he's keeping the young core of this team together by dealing his high-priced goaltender. That takes some chutzpah, but Yzerman's looking longer term than just this year's playoffs. The Martin Hanzal sweepstakes came to a close with two trades. The major portion of the trade is seen above, but the Wild also flipped Teemu Pulkkinen to the Coyotes for future considerations minutes later, so let's include that as a portion of this deal as well. It will make things a little more even if you're a Coyotes fan. The Wild have an outstanding team this season. Devan Dubnyk is providing exceptional goaltending, the defencemen are mobile and skilled, and they are getting key contributions up front from the likes of Granlund, Staal, Koivu, and Coyle. I haven't even mentioned Zach Parise or Jason Pominville, so you know they possess a deep and talented roster. By adding Hanzal and White from Arizona, they get stronger down the middle by having an excellent face-off man and another big body in Hanzal join the club while adding some grit and scoring in Ryan White. This team is really looking like they'll be a contender in the Western Conference with these additions, and the fans in Minnesota should be excited with what the Wild did yesterday. The Coyotes are still adding youth, but they're adding some smart pieces. The picks alone will be worth something if GM John Chayka can unearth some gems with them. Grayson Downing is a big kid who has shown some nice progress in Iowa this season, and he could be a smart bottom-six guy for the Coyotes as his game develops. By adding Pulkkinen in a later deal, the Coyotes get a guy who has shown that he can score at the NHL level if given a shot, but he still needs to work on skating and positioning if he wants to be full-time top-six player. In what might be becoming a broken record for Coyotes fans, the future is bright in Glendale. Unfortunately, this team is still trying to reach that sun on the horizon that always seems to just out of reach. There's no doubt the Wild will have won this trade if they go deep in the playoffs. However, if they're upset in the opening round, they will have overpaid for Hanzal who may not stay when it was thought he could help them to the promised land. The jury's still out on this trade. In perhaps the biggest deal of the last couple of days, the Washington Capitals added arguably the biggest piece on everyone's trade list when they dealt for Kevin Shattenkirk. While it should surprise no one that the best team in the NHL was looking to solidify that status a little more, the price they paid seemed less than what was expected considering what they got back in the deal. Adding Shattenkirk was a heckuva move for the Capitals who can now boast arguably the best defensive corps in the league. Carlson, Alzner, Niskanen, and Shattenkirk are going to be dangerous for the remainder of the season, and Shattenkirk's addition should almost guarantee the Capitals the President's Trophy. On the other hand, the piece that really impressed me was the addition of Pheonix Copley as he's been a solid performer at the AHL level this year. Copley gives the Capitals all sorts of flexibility at the goaltending position now, and his addition to the AHL's Hershey Bears could push the Bears back into a playoff spot as they chase down the Bridgeport Sound Tigers. St. Louis gets a good young player in Zach Sanford who should make the Chicago Wolves even tougher to beat in the AHL. He sees the ice well, and he has excellent vision when it comes to setting up teammates. Brad Malone will also make the Wolves better as his gritty style of play would have been right at home in the games against Iowa this past weekend. Obviously, the draft picks will strengthen the Blues for the future, but that's where the key to this trade lies. Like Yzerman and the Lightning, GM Doug Armstrong was not going to be able to re-sign Shattenkirk this summer, so this was about opening up a roster spot and some salary for the kids who are moving forward. Players such as Vince Dunn and Brad Hunt are going to push for roster spots next season, and the money that it would have cost to keep Shattenkirk in the fold in St. Louis meant that Armstrong would have to deal other pieces. Personally, they got some decent return for Shattenkirk, but I would have thought other teams may have offered more. Similarly to the Wild, the results of this trade will depend entirely on what Washington does in the playoffs. Another early exit will have fans howling once again as Shattenkirk will most definitely leave in the summer without having a parade through town and without a first-round pick to use. The jury will remain out on this trade, but just retaining Pheonix Copley in a deal like this won't make fans happy if there's no Stanley Cup. Teams are already making big moves, so maybe don't book off work on Wednesday, ok? Just four teams remain in the battle for Canada West women's hockey supremacy, and it would be the top-four teams squaring off this week as Saskatchewan traveled to UBC for one series while Manitoba made the trip to Edmonton for the second series. If you follow me on Twitter, you know that I've lamented in the fact that three of these teams are ranked in the top-six in the nation with only two berths at the USports National Championship available. In other words, potentially two of Canada's best ranked teams could be eliminated from the national tournament in March if things don't go their way. Let's find out what did happen, though, on this week's edition of The Rundown! MANITOBA at ALBERTA: There might have been some concern from Pandas fans that their team could come out a little rusty having had a bye week between the end of the regular season and Friday night's games, but that was erased early as the Pandas showed a ton of jump out of the gate. They would force Manitoba into drawing a penalty early on, and it would be Abby Benning ripping home a shot through a screen and past Rachel Dyck from the point at 5:23 to put the Pandas up 1-0. Both teams would settle down after the early power-play goal, though, as each side only managed four shots through 20 minutes of play. The Bisons elevated their play at the start of the second period. Lauryn Keen, Canada West's leading scorer this season, followed up on her own initial shot to gain possession of the rebound where she turned and fired a shot that banked in off Lindsey Post from behind the goal line to knot this game up at 1-1 just 1:24 into the period! That score wouldn't last long, though, as the Pandas re-asserted themselves after the equalizer. Amy Boucher got in behind the Manitoba defence and received a great outlet pass from Kelsey Tangjerd to send her in alone where she made a gorgeous move to beat Dyck to make it a 2-1 game at 3:03! Lindsey post came up big in the second period for the Pandas as well as she stopped all eight shots fired on her by the Bisons as Manitoba led 12-7 in shots, but trailed 2-1 after 40 minutes. If scoring early in periods wasn't a trend, it sure was after this game. With Venla Hovi sitting in the penalty box, Cayle Dillon's point shot was deflected beautifully by Alex Poznikoff through Dyck's five-hole, and the Pandas had a 3-1 lead just 1:42 into the final frame. Kennedy Ganser would head to the box 1:10 later, and Manitoba would capitalize on the power-play. Erica Rieder jammed a loose puck under Lindsey Post's pad from the side of the net at 3:53, and Manitoba trailed 3-2. Alberta controlled the middle of the period, but Manitoba began to play desperation hockey. Despite their efforts, Post and a number of blocked shots kept the puck out of the net as Alberta prevailed in Game One by the 3-2 score. Post stopped 14 shots in the victory while Dyck made 12 saves in the loss as Alberta went up 1-0 in the series. MANITOBA at ALBERTA: The Bisons would have last change on Saturday afternoon as Game Two went in Edmonton. Both the Pandas and Bisons came out shooting and skating as chances were had at both ends, the Pandas would break the scoreless game midway through the period. Abby Benning skated the blue line until she found a shooting land she liked, and her blast would find the twine past Rachel Dyck at 12:58 to put the Pandas up 1-0. Despite the opportunities they found, the Bisons could not beat Lindsey Post through the opening frame. An early power-play in the second to Manitoba after Deanna Morin was sent off for tripping saw the home team on visitors' ice tie the game. Karissa Kirkup found herself all alone in the slot and the puck found her, and she made no mistake in beating Post at 3:51 to make it 1-1. The Pandas would restore the lead just past the midway point when Cayle Dillon's rush saw the initial shot kicked aside by Dyck, but Ashley Morin pounced on the loose puck and fired it past a prone Dyck at 11:23 to make it 2-1 Alberta. For the rest of the period, Post and Dyck saw nothing as the two teams went into defensive mode and didn't generate another shot! Manitoba poured the pressure on Alberta in the third period from start to finish, but shots that missed the net and saves by Lindsey Post kept the Bisons from finding the equalizer. With Dyck on the bench and Manitoba on a power-play late, Kennedy Ganser took the opportiunity she found by firing the puck into the open net while shorthanded to make it 3-1 for Alberta at 19:02. Venla Hovi wasn't going to go down without a fight, though, and she beat post with 11 seconds remaining. It was too little and too late, however, as the Pandas took Game Two by a 3-2 score and won the series 2-0. Post stopped 22 shots in helping the Pandas advance while Dyck made 14 saves in Manitoba's final gae of the season. SASKATCHEWAN at UBC: Fourth-place Saskatchewan ventured over the mountains to play first-place UBC in the other semifinal series. This one was a defensive battle from the drop of the puck. UBC would score the only goal of the opening period when Nicole Saxvik's shot was kicked aside by Cassidy Hendricks, but Mathea Fischer put the rebound back on net almost immediately and beat Hendricks at 7:31 to put the T-Birds up 1-0. Chances were few and far apart after that as the teams carried that score into the intermission. After a scoreless second period where, again, neither team had many chances, it would be some sort of magic or trickery that seemed to get the next goal. Hendricks poke-checked Madison Patrick in tight, and somehow the puck went up and over Hendricks before just barely sliding across the line. If there truly are hockey gods, that goal might have been purely on them as I still can't figure out how that puck ended up behind Hendricks. In any case, Patrick's goal at 3:27 of the third period put UBC up 2-0, and that was more than enough for Amelia Boughn on this night as she shut the door on the Huskies for the 2-0 win and the 1-0 series lead. Boughn stopped 14 shots in the shutout while Hendricks made 17 stops for the Huskies. SASKATCHEWAN at UBC: The Huskies would assume home-team responsibilities in Game Two on Saturday, and this game was a carry-over from Game One's defensive battle. However, Saskatchewan would score the only goal of the first period early on as Bailee Bourassa's shot was stopped by Amelia Boughn, but Rachel Johnson picked up the rebound and zipped it past Boughn at 2:56 for the 1-0 Saskatchewan lead. Did I say "the only goal of the first period"? How about that goal being the only goal in the entire game? Both Boughn and Cassidy Hendricks didn't allow another shot to pass through the remaining 57:03, leaving the Johnson goal as the lone marker in a 1-0 victory for the Saskatchewan Huskies! With the series tied at 1-1, we'd have a Sunday game! Hendricks stopped 23 shots in pitching a shutout while Boughn stopped 17 of 18 shots for the Thunderbirds. SASKATCHEWAN at UBC: It was do-or-die, win-or-go-home on Sunday for both the Huskies and T-Birds. The Huskies were looking for the major upset while UBC wanted another shot at a national championship. The first period had an entirely different feel as UBC struck early. Kathleen Cahoon's shot would be turned aside by Cassidy Hendricks, but Haneet Parhar corralled the loose puck and was able to elevate the puck past Hendricks from a tight angle at 4:20 for the 1-0 lead. UBC would double that lead eight minutes later when Kelly Murray's shot from just above the high slot area found its way through traffic and Hendricks at 12:37 for the 2-0 lead. Saskatchewan would rally and get one back before the end of the period as Alyssa Dobler's low shot somehow got past a screened Amelia Boughn at 17:28, and the teams would head into the break with UBC leading 2-1. The defensive game returned in the second period as neither team generated many chances with their seasons on the line, so we'd go to the third period with the 2-1 score still intact. Both teams played cautiously, but looked for another goal. Hendricks would be called to the bench with more than two minutes to play as Saskatchewan pressed, and Boughn made a number of key saves to keep UBC up by a goal. With five seconds to play, Nicole Saxvik booked UBC in the Canada West final with an empty net goal, and the T-Birds advance on the strength of a 3-1 victory and a 2-1 series win. Boughn stopped 21 shots in the victory while Hendricks made 18 saves in the loss. And then there were two. The UBC Thunderbirds will play host to the Alberta Pandas next weekend in the CWUAA Women's Hockey Championship Final. Both teams have already earned berths at the USports National Championship, so this series is for bragging rights and pride as both teams will potentially meet at the Strathcona Paper Centre in Napanee, Ontario from March 16-19. Honestly, these two teams were the two best teams in Canada West this season with UBC stringing together a 15-game win streak earlier this season while Alberta goes into the final series against UBC on a 13-game win streak. This championship will determine which team officially won the west this season. With Slap Shot turning 40 years-old today, I was going to speak about the influence it had on hockey back in the 1970s and early-1980s as the cult status of the film grew. Instead, the film seemed to come to life tonight in the AHL as division rivals met and spilled some blood on the ice and in the hallway to the dressing rooms. 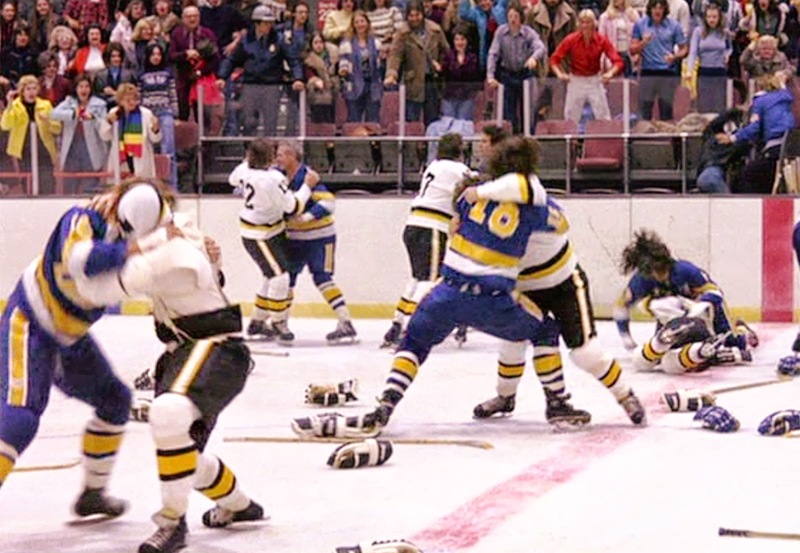 Honestly, the image of the brawl from Slap Shot above wasn't far off the results seen on the ice tonight between the Chicago Wolves and Iowa Wild, but it's what happened after the line brawl that will evoke memories of the hockey film! The eventual final score from this game was a 4-1 victory for the Chicago Wolves, but the game's ending had quite the finish. Vince Dunn and Kurtis Gabriel gave both the fans and the players quite a show on this night, and you'll want to jump ahead to the 4:15 of this video to take it all in! Honestly, Gabriel deserved what he got for going hit on the hit, cross-checking Dunn in the face, and then for having the stones to walk over to Dunn after both were sent off with fighting majors with less than five minutes to play. That cut on Gabriel's cheek from the stiff right hand of Dunn probably more than made up for the not seeing the last minute of play. I understand how rivalries go and these two teams have one, but imagine these two teams in a playoff series against one another. Wait, what's that you say? It could happen? The Wolves will need some help since Grand Rapids has four games in-hand on Chicago, but these two teams could potentially meet in the opening round of the Calder Cup Playoffs if the hockey gods had any will to make it happen. You have to hand it the AHL schedule makers, though, as the Wolves and Wild will tangle FIVE more times before end of the season including tomorrow's rematch! Get popcorn and beverages, folks. This divisional matchup could spill over into an all-out war by the time the season is over. And then there's the potential for seven more games of this craziness! There was a lot of anticipation when the Colorado Avalanche announced at last summer's NHL Entry Draft that they were taking Penticton Vees player Tyson Jost with the tenth pick in the event. A number of people, including TSN's scouting guru Craig Button, talked about how much talent Jost has, and we saw some of that ability at the World Junior Championship in December. 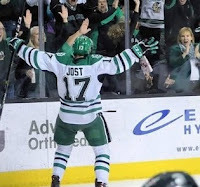 For Colorado Avalanche fans, there's excitement brimming on the horizon because it appears Jost is finding his way in the nCAA with the University of North Dakota, and the winning goal he scored in tonight's game against Omaha should have Avs fans rubbing their hands together for what the future holds. I was sent a link to see the goal a couple of dozen times by a number of people. Honestly, I really wish that there was some way that NCAA hockey would be shown in Canada more often because there is a ton of great hockey being played at the collegiate level in the US by both men and women. My wishes aside, though, Tyson Jost may have just scored one of the goals of the year when he undressed two Mavericks en route to scoring the game-winner. Have a look-see at these hands. Holy moly, what a goal! As a defenceman, playing against someone who can stick-handle like Jost without your stick is a death sentence. Joel Messner, a Lorette, Manitoba product and former Selkirk Steeler from the MJHL, was the player who lost his stick behind the net. Messner should have pinned Jost to the boards in this case, but he was already a step behind the sniper. Once Jost got himself free, Messner should have simply let Jost skate into him where he could have tackled the freshman Fighting Hawk. Take the penalty to prevent the goal. Instead, Jost dangled him nicely, and was on his way to the slot area untouched. The second player to fly by Jost as he deked into the slot was Luc Snuggerud. Snuggerud, whose hockey lineage includes dad Bo who is a legend at the University of St. Thomas and uncle Dave who played in the NHL, was drafted by the Blackhawks in the fifth round in 2014, but he looked nothing like an NHL pick with that defensive effort. Jost walked around him like he was barely there, and the two defencemen really left Alex Blankenburg out to dry against one of the best freshmen in the nation. That's a heckuva goal on a Friday, folks. And it doesn't even appear on SportsCentre. The Hockey Show, Canada's only campus-produced hockey radio show, hits the air tonight with some chatter about everything happening in the NHL right now as deals are being made and lineups are being evaluated and adjusted for the final push to the playoffs and beyond! We'll talk about the deals already made and which ones seem smarter than others as well as taking a peek at what some teams might do with guys they've deemed expendable! It's a big show for deadline deals, so let's roll! Tonight, we'll wrap up the road trip to Kenora for Scotiabank Hockey Day in Canada with our final thoughts on Kenora, talk about the potential players available for trade deadline deals, players who have been traded already, a discussion on what the Jets and Moose need to change, and we'll plug Barys Astana in the KHL, the Aalborg Pirates in Denmark's Metal Ligaen where Brandon Reid is coaching, the CWHL Clarkson Cup Playoffs, and the CWUAA Women's Hockey Playoffs! There's a lot to talk about on th show tonight, so make sure you tune into the program at 5:30pm CT! If you're gonna be out and about tonight, but still want to hear the show, you really should download the UMFM app. Like now. It's the easiest and most convenient way to listen to any of UMFM's great shows, so get to it! Just follow this link on your iDevice or this link for your Android device and get the UMFM app! It's never been easier to tune into The Hockey Show or UMFM! Download the UMFM app today! Tonight, we talk trades, what needs to change, what has changed, international results, and the outstanding city of Kenora, Ontario on The Hockey Show only on 101.5 UMFM and on the UMFM app! As we near summer, the annual movement of AHL teams will get underway. We already know of a few teams that will be changing addresses next season, but the Senators - currently of Binghamton, soon-to-be of Belleville - made a stop that one normally doesn't see while playing for their current-and-soon-to-be-former city. Some would say that holding a practice in the city you intend to move to shows a wee bit of disrespect for the current city and its fans, but the Senators cared not for societal norms today as they arrived for a meet-and-greet and practice in Belleville, Ontario. More than 300 enthusiastic fans showed up for the open practice in Belleville today to watch their soon-to-be new team work through the drills on the ice before the team got a tour of the practice facility they'll be using next season. The reason they made this stop is because they are returning to Binghamton from Toronto where they fell to the Marlies 4-2 on Monday before hosting the Marlies on Friday. Having three days off between games means this is quick visit before they get back to business at home. 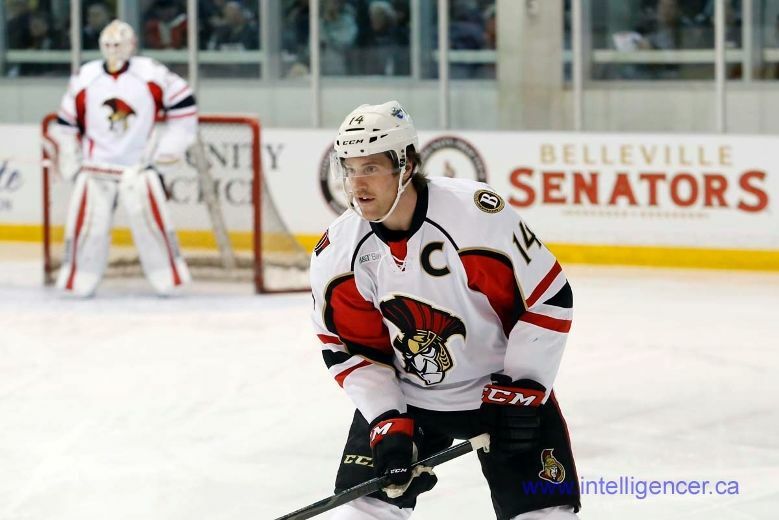 "It was unreal coming out here and seeing the stands full and people cheering," Senators captain Mike Blunden told Paul Svoboda of The Belleville Intelligencer. Blunden's brother, Stephen, played for the OHL Bulls from 2006-08. "It's going to be fun here. Belleville's a great hockey town. It was a great OHL town. My brother loved it when he played here." If you're still reading this with one eyebrow raised and questioning the motives of the why the B-Sens would make this trip, it appears this visit to their new home was initiated by the players. "The players all agreed to stop here," said Belleville rec director Mark Fluhrer. "This is a day off for them. They're coming off a road trip. We're very appreciative of their efforts." It sounds like fans, arena management, and the team are all pretty happy about this unscheduled stop on the team's day off. I'm not entirely against the team making this effort, but it just seems like with the Senators some half-dozen points back of a playoff spot, they're looking forward to next season instead of trying to close out this one with, to quote another red-and-black clad man in Deadpool, maximum effort. I'm happy that Belleville is finding hockey after the OHL's Bulls left town, but it's not like the Albany Devils have gone wandering into Binghamton while the Senators were away and started checking out their new digs for next season. Albany is focused on the task at-hand as they compete for top spot in the AHL's Atlantic Division rather than taking road trips to Binghamton to meet fans. There will be lots of time for that in summer as the team makes its move, but the Devils know they have a job to do. I don't know, but this seems like a classless move to me when there's still a month-and-a-half of games to play as the Binghamton Senators. I know that the city of Belleville is awaiting their arrival, but the Senators are still representing the city of Binghamton for the remainder of this season for however long that lasts. Showing up at their new home prior to the end of the season, to me, shows a serious lack of respect for the city of Binghamton. I was a fan of the Senators in Binghamton, I would have dropped my support of them like a bad habit upon reading this story. The relationship was already tenuous with the announcement of the Senators moving, but this just shows a lack of tact when it comes to ending the relationship with Binghamton and the hockey fans in that city amiably. It's rare in the sports world today for any team to lead its league all season without faltering. Teams go through ups and downs just like everything else, and other teams can get hot at the right time and overtake them. Sometimes, injuries play a part in slowing a team's progress. The fact that this is something rare makes accomplishing the feat that much more meaningful for the members of that team, and it speaks volumes to the work done off the ice with regards to team building, game preparation, fitness, and recovery. After 43 games, let's throw some credit at the Aalborg Pirates as they have officially clinched first-place in Denmark's Metal Ligaen after leading all season long! There are still two games to play and the Odense Bulldogs could conceivably tie the Pirates with 88 points, but Aalborg holds the tie-breaker between the two teams after today's 6-2 win over the Herlev Eagles, giving last year's eighth-place team a new accolade as they will finish as the top team in the league this year! Aalborg currently sits at a 26-11-4-2 record, and will hold home-ice advantage throughout the playoffs unless they fall. For a team used to traveling for playoff games, this will mark a major change for the organization! Who they will play is still up for grabs, but you can't think anyone wants to roll into Aalborg after this season. 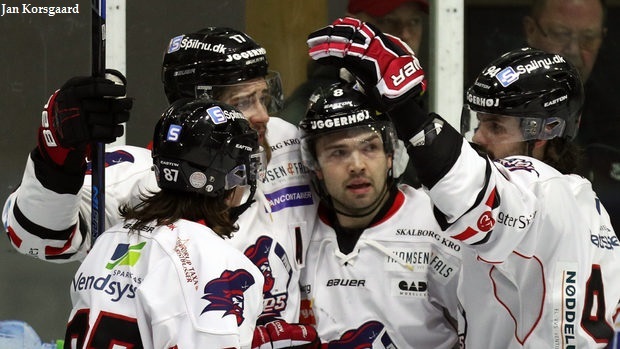 As of writing, the Rungsted Seier Capital are five points back of seventh-place SønderjyskE, and Aalborg sports a 4-0-1-0 record against Rungsted this season as they have outscored them 15-7 in their five contests with the one shootout goal taken out. 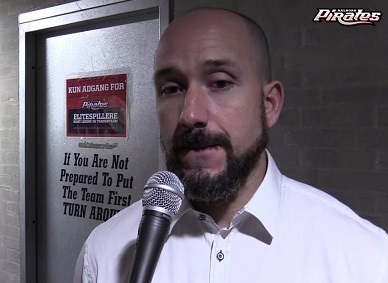 It hasn't been easy despite a recent 6-2 victory over Rungsted, and the pressure only ramps up in the playoffs so the Pirates will need to be ready for a team that has played them close all season long. The key in the Metal Ligaen playoff scenario, though, is that Aalborg will be able to choose which team of the bottom-four playoff teams they'd like to play! This unique playoff scenario means that the seemingly-tough Rungsted team may not be the team that Aalborg chooses if they've found more success against the other teams, and there are five teams in contention for the bottom-four spots right now. Clearly, the team will have some decisions to make before kicking off the most anticipated playoff season in some time! Among the individuals who are leading the way for the Pirates, one of the early recruits that Brandon Reid brought into Aalborg was 27 year-old defenceman Bryce Reddick. The Winnipeg-born player is the son of former Winnipeg Jet Eldon "Pokey" Reddick, and he had a special set of skills that Reid liked in recruiting. Reid told Mike McIntyre of the Winnipeg Free Press in June, "We needed a guy with good speed who could really control the power play. A right-handed shot. We looked at all the options we got from the agents. One main thing is you got to be a good person if we're going to take you. He was the perfect fit for us." Reddick has kept his end of the bargain as it appears he'll finish fourth on the team in scoring this season and as the team's leading scorer from the blue line by a large margin. Reddick has been a key cog in Aalborg's defensive turnaround as well as he has the abilities to either skate the puck out using speed or make a good outlet pass, and his speed is vital in chasing down opponents while being extremely mobile in his own zone. He's the kind of player that Reid leans on to settle the team defensively thanks to his capabilities, and it's quite clear that Reddick is thriving in the opportunity. I'd be remiss in not speaking about Peter Quenneville once more. Quenneville was a goal back of league-leading Harrison Reed of SønderjyskE just a week ago, but today's scoring race sees Quenneville atop the league's goal-scoring standings with 29 markers to date! He's also fourth in overall scoring with 48 points, just one point back of two players. I doubt he's going to score 12-15 points over the next two games to catch Odense's Dale Mitchell for the overall scoring league, but anything can happen. I'm almost certain, however, that head coach Brandon Reid isn't going to run one of his best players ragged for a scoring title. Another player who deserves a lot of kudos is Julian Jakobsen. Relatively unknown to most hockey fans on this side of the ocean, the former Swedish Elite League and German League centerman has found some incredible chemistry alongside his national team partners in the Hojberg twins on the top line, and the result is that the 29 year-old Dane sits second in assists with 34 this season, just two back of league-leader Dale Mitchell. He's a very fluid skater with good vision on the ice, and he loves to generate offence. While his goal total of eight will largely be overshadowed by Quenneville's total, make no mistake that Jakobsen can score if given the opportunity. His play-making ability is what has him on Aalborg's top line, though, and that's come through in spades this season. And let's not forget about the man between the pipes who has had a direct contribution on Aalborg's minuscule goals-against total this season. Ronan Quemener is another one of those unknown players to most North American fans, but let's run down the stats this 29 year-old French netminder has put up this season: seventh in save percentage (.918), seventh in goals-against average but fourth among goalies who have played 2000+ minutes this season (2.06). That's nearly a goal-and-a-half better for GAA and some 30 points better in save percentage compared to last season's starting netminder. To say that netminding hasn't been a key contributing factor in the Pirates' turnaround would be underselling how important Quemener's contributions have been this season! So the Aalborg Pirates have some key players and have take some important steps in earning their best finish ever in the Metal Ligaen. The players above have been key contributors, and the team is playing exciting hockey. None of that matters, of course, if no one is watching the team. As head coach Brandon Reid told McIntyre in his article, "We're trying to do what the Winnipeg Jets are trying to do. We're trying to bring back that fever. Aalborg is a great hockey town. It can be something great if you get that winning culture into it. There's big opportunity over here. It can be a really great lifestyle. I played 10 years in Europe. I'm known over here, my wife and I feel comfortable." Aalborg has a 5000-seat arena, one of the largest in the Metal Ligaen. In 2015-16, the IIHF reported that the Metal Ligaen averaged 1361 fans per game, meaning there may been a lot of empty seats in Aalborg's arena. That was down from 2014-15 where the league averaged 1481 fans. That's a worrying trend, but it seems Aalborg has followed that trend as shown by the numbers on The Internet Hockey Database as attendance has fallen year after year after that third-place finish in 2013-14. Granted, the team was the second-most watched team in 2015-16, but the arena would look empty with more than 60% of the seats still unfilled. It sounds like Reid's efforts in making this team the best in the circuit could push Aalborg to being the most attended team in the league if photos of the rink are any indication of the city's excitement over their hockey club's performance. Unfortunately for us, the Metal Ligaen doesn't release attendance reports on their website. "From what I've heard, he used the hall to be packed with people, it was not just sport, it was an event," Reid told MigogAalborg.dk, and stresses that his goal is to get that mentality back in town, and he is not in doubt if the team has the potential to bring Aalborg Gens are back to hockey hall. "About three years if all according to plan, we have 5000 spectators for each game, not only because we continue to win, but because hockey culture is back in town." Season tickets in Aalborg are only 1000 Krone or about $186 CDN. Aalborg simply wanted to see more tickets sold to the walk-up crowd so they can put more butts in seats. One of the most amazing things about the attendance figures for Aalborg this season that will eventually be released is that Aalborg did something completely unheard of in professional sports: walk-up tickets were free all season long... with an asterisk. You might be shaking your heard in wondering how a professional hockey team with costs and expenses to pay can offer up free tickets. How they do it is completely unique. Instead of charging for every ticket, beer, and soda as fans walk through the door, the Pirates' only caveat in entering the arena is that before the entering of the arena, fans must buy a beer or soda for a maximum of 40 Krone! By doing this, fans get a ticket and a beverage when they show up to the rink! "The concept has been received with great enthusiasm by both fans and partners. I have received countless inquiries from fans and sponsors and had visits from both North Jutland, P4, TV2 north and our own TV team yesterday. 10 minutes after the publication, internet traffic on the net was so large that the server crashed. We are all wildly enthusiastic about the massive reception this concept has gained. Now we cross our fingers for the city's suppoort with a great turnout in the new season," said Pirates boss. "Gigantium is a great arena, and all our fans and sponsors love when there are many people in the hall. The new initiative is only possible thanks to good partners," says Bjuring. Pirates management wanted a full arena, but they needed to do more than just offer a beverage and a ticket. There had to be a reason to come down to the rink if the Pirates wanted to see this promotional idea come to fruition. I can honestly say that the Pirates are a much better team with Brandon Reid in charge, and that culture both he and Bjurring spoke of is spreading wildfire through the Aalborg region. Once players have enough money to live comfortably, they will seek out winning cultures in hockey because the window to win championships decreases daily for players. Not every player will say he has won a championship, so players will seek the best places they can win in order to fulfill that need to win. Both Detroit in the 1990s and Chicago in recent years have seen veteran players come to the team for less money in order to have a shot at a championship. Brandon Reid is building the same winning culture in Aalborg with his team, and that three-year plan he spoke of has been kick-started in a big way with this incredible first season. In the end, if the Aalborg Pirates somehow are upended this season in the playoffs, there will be disappointment in them falling short. The goal of any hockey team is to win its respective league championship each and every year. Brandon Reid's work in recruiting impact players, getting more out of returning players, and giving fans a reason to flock to the arena is already paying dividends in his first year, but this is only Year One of what appears to be a three-year plan. Losing will hurt, but the culture being installed in Aalborg should guarantee repeated success in future years. Make no mistake that fans a love a winner and Aalborg will continue to see support as they move forward with the plan. Finishing atop the standings in the Metal Ligaen is an incredible accomplishment for Brandon Reid and the Pirates. I don't know if anyone would have predicted this in his first season, but we stand here today with that fact in-hand. The playoffs stand before the Pirates, and they'll need to be better than they were in the regular season if they hope to capture the Metal Cup. I suspect Brandon will have the players ready to go once the calendar flips to March. Seasons, however, will come and go. The big picture in long-term sustainability for this franchise is changing the culture surrounding this team, and that job has only started for the Pirates. But let's make sure we call a spade "a spade" when it comes to how they started this three-year plan: pretty damned great! And the Pirates can cap it off with twelve wins over the next month to hoist their first Metal Cup in club history and the first in the city's history since 1981! 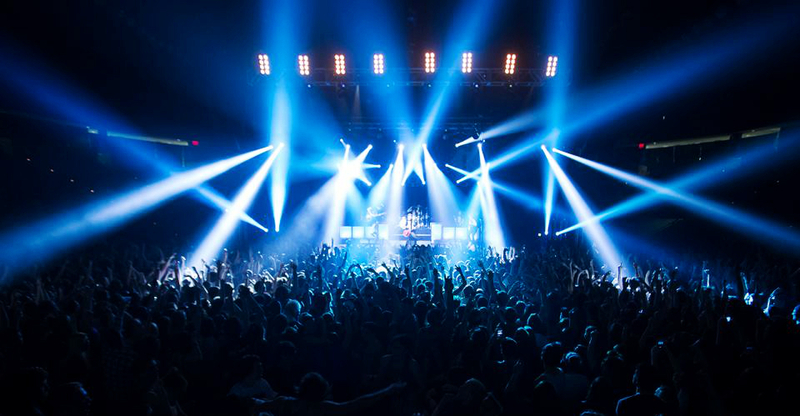 We've almost worked our way through another season on the calendar year, and that means there have been a vast number of concerts that have gone on in and around hockey rinks all over this great land. With every visit, some rinks hand out jerseys like flyers to anyone who can carry a tune. Other jerseys are acquired by the artists for a purpose. The key is that all of the following musicians are wearing or holding hockey jerseys that show some support for the event or city they are appearing in that night. That's right, folks. It's another Musicians in Jerseys article! The full list of musicians can be found here, and I believe every team is represented at this point. There are some musicians who represent a large number of teams thanks to their affinity for collecting jerseys, and there's another one of those musicians below. Peruse at your leisure and see who has represented hockey teams from across the world! We're going to start with a guy who is representing six teams in today's article. Country musician Dierks Bentley has carved out a nice little music career with a number of hits, but he takes his hockey very seriously when he's not in the studio or on stage! If you didn't think so, here are six examples as Dierks suited up in an Edmonton Oilers jersey, donned a Grand Rapids Griffins jersey, sported a Saskatoon Blades jersey, celebrated in a Waterloo Black Hawks jersey, highlighted a Saint John Sea Dogs jersey, and jammed out in an Oklahoma City Barons jersey! Just when you thought you may have seen enough of Dierks Bentley, he also popped up in an All-Star Game jersey with Chris Young! These two are looking quite dapper at the mid-season event! Also appearing at various All-Star Game events were Carly Rae Jepsen, Vince Gill and his daughter Corinna Gill, Snoop Dogg, Tracy Lawrence, Chris Young and Amy Grant, R5's Ross Lynch, Eli Young Band bassist Jon Jones, Kelsey Ballerini, and the kid who got hammered by Chris Pronger. That's a heckuvan all-star team of musicians! I will fully admit that I have no clue on any song titles for musician Ace Hood, but the man has a hockey allegiance! Antoine McColister was born and raised in Florida where he was a football player until an injury sidelined the hip hop musician's dreams of playing professional football. He's been making music since 2006, so it was a little surprising to see him wearing the colours of the Edmonton Oilers on a recent tour! The Arkells are a successful Canadian band that calls Hamilton, Ontario home. We've seen appear on the list once as they threw their support behind the Toronto Maple Leafs, but their recent tour took them through Edmonton as well where they were given their very own Edmonton Oilers jerseys! I don't think there is enough recognition given to indigenous music in society, let alone the major awards shows, and I'm happy to feature one of Canada's best indigenous music groups here. The Northern Cree Singers have been nominated for six Grammy Awards in their time, and they are up for another one this year with their album Temptations. The Saddle Lake Cree Nation musical group recently had a photo taken, and a number of the band members showed support for the Edmonton Oilers from their home province! Good luck at the Grammy Awards! Hockey has been a long supporter of our troops over in far-off lands, and a number of NHL players have fought in wars through the history of the NHL. The NHLPA has asked its alumni on occasion to go overseas to visit the troops in an effort to thank them for their service, and they routinely take other celebrities along with them. One such case was when Alan Frew accompanied the players over to Kandahar! Alan Frew fronted Glass Tiger and has released solo albums, and he proudly wore the colours of the Toronto Maple Leafs on this trip! Robert Smith of The Cure is already on the list in a white Maple Leafs jersey, but it appears he had the complete set as he also wore a blue Toronto Maple Leafs jersey on stage! Gene Simmons, Paul Stanley, and KISS have appeared on the list a few times. If there was ever one of those moments where you'd want to see an iconic band with iconic jerseys, KISS made an appearance in St. Louis during the 1990s where the Blues decided to celebrate their appearance in the city with Gretzky-era Blues jerseys! The key in that photo? Those are pro jerseys, not replicas! I have no clue about her music, but rest assured that Zendaya Coleman - known better just as Zendaya - sings. She also acts and dances as she was part of the Disney Channel sitcom Shake It Up. She's a pop/R&B singer, but she hasn't received any sort of critical recognition as of yet. A couple of years ago, she was asked to sing the anthem at a CHL Bloomington Blaze game, and she was given a Blaze jersey of her own! Speaking of people names "Daya", the Pittsburgh musician was invited to the World Cup of Hockey as part of the musical performances there. I would have thought she might represent a Canada jersey with Crosby being from Canada and the musical event being held in Toronto, but she went with the trendy choice and wore the colours of Team North America! Fifth Harmony has had its negative publicity after pulling out of the NHL All-Star Game festivities at the last second, but they haven't missed a beat when it came to their tour a year ago. The five-some at the time toured through Tampa and appeared at Amalie Arena where the Tampa Bay Lightning made sure they endeared themselves to the hometown crowd! James Hetfield and Metallica are big supporters of the San Jose Sharks, and they've appeared on the list before. This is simply the gents playing the anthem prior to the game in more Sharks jerseys! Paul Brandt. Country musician. Proud Canadian. He's won a ton of musical awards and accolades, and he's a big act in Canada. For some reason, he's never really caught on in the US yet, but country music fans tell me that American country music fans are missing out. Maybe it's his choice in hockey jerseys? O.A.R. is a solid rock band whose origins in Maryland would make one believe that they may have an affinity for the Washington Capitals. Currently on tour with Train, O.A.R. showed support for another team when Marc Roberge and Richard On donned the uniforms of the Minnesota Wild to play a little shinny! Sportsnet's Hometown Hockey program is hosted by Ron MacLean and Tara Slone. I'm not sure how many people know this, but Tara Slone is actually a very accomplished musician! Slone started with aspirations as a child to become an opera singer, but it was at Concordia University where she began singing rock music where she would eventually front the band Joydrop. She has been nominated for a Juno, appeared on Rock Star INXS, and was a former host of Breakfast Television on CityTV Calgary. Needless to say, she's had a heckuva career thus far. In appearing in Hometown Hockey, Tara's been able to add some new clothes to her wardrobe. She's received a jersey from the Saint John Sea Dogs, the Moose Jaw Warriors, the Newmarket Redmen, and the Kootenay Ice! The jersey was designed by the Kingston Frontenacs and Catstich, an Ontario-based jersey manufacturer who specializes in theme jerseys for hockey teams. "We started with the base of the 1964 Boston Bruins home jersey, to reflect the year Gord Downie was born and his favourite team," said Chenier. "We added The Tragically Hip's logo-wordmark from their 2011 concert at Bobcaygeon as the main logo on the front of the jersey, and their signature-wordmark on the back. In the background of the jersey is the name of every album and song recorded and released by the band, from their self-titled 1987 debut to 2016's Man Machine Poem. We wanted to include the lyrics of every song they've recorded, but typed in 11-point Arial, the 30,333 words, or 128,380 characters was 45 pages long." While they have yet to unveil how much money was raised, they will do so next week at a special press conference where it's expected that the Frontenacs will have raised the most money for any charity off this jersey auction. Well done, Kingston, on this auction and to the fans who pledged their money in helping this incredible charity with their purchases of these unique uniforms! Once again, if you're hunting for other images, please check the full list of musicians here before sending me pictures. I unfortunately had to leave a number of pictures off this article simply due to people sending images that are already linked. I do want to see your images, though, so please send me any pictures you want included and I'll credit you! This week's edition of the Rundown will be shorter than most thanks to the fact that only four teams in Canada West women's hockey saw action. Two teams unfortunately did not acquire enough points to make the playoffs while those that had all too many points for their own good got a week off as a reward for finishing atop the standings. The four teams in the middle squared off in the opening round of the CWUAA Playoffs with their reward for winning being a road trip while losing would end their seasons. Who would move on? Let's find out on this week's episode of the Rundown! REGINA at SASKATCHEWAN: The fifth-place Regina Cougars traveled north to Saskatoon to meet the fourth-place Huskies in the battle of Saskatchewan with a trip to either Vancouver or Edmonton on the line. Like any good playoff series, this best-of-three saw the first period go scoreless as both teams began to feel one another out for weaknesses. Regina would carry a 10-8 lead in shots into the second period, but both Regina's Jane Kish and Saskatchewan's Cassidy Hendricks played well in the opening frame. Lauren Zary's bodychecking penalty with 28 seconds left in the first period carried over into the second period, and it would kick off the scoring for both teams. Saskatchewan would grab the lead just 48 seconds into the period while shorthanded as Kaitlin Willoughby got just enough blade on the puck sent over to her by Kayla Kirwan to get it past Kish for the 1-0 lead. 39 seconds later, Regina ended the power-play when Melissa Zerr took a pass in the slot and went high stick-side over the shoulder of Hendricks to make it a 1-1 game at 1:27. Saskatchewan's Kira Bannatyne would head to the sin bin 23 seconds later, and Regina would use this new power-play to gain the lead when Alexis Larson's shot from the point found its way through traffic and was tipped by Tamara McVannel past Hendricks at 3:02 to make it 2-1 for the Cougars! Saskatchewan, though, would use a power-play of their own to tie the game as Willoughby's rush into the zone saw her zip a shot past Kish at 7:32 to make it a 2-2 game! The remainder of the period saw the teams trade chances, but they would enter the second intermission deadlocked at that 2-2 score. Saskatchewan went up 3-2 just 4:52 into the third period when - who else? - Willoughby found a puck in the slot and wired the puck stick-side past Kish. Exactly two minutes later, Kori Herner was sent in on a breakaway off a neutral zone turnover, and she made no mistake in beating Kish to make it a 4-2 game for the Huskies. Regina would make a desperate push late in the game as Jaycee Magwood was able to close the deficit to one when she beat Hendricks off a scramble in front of the Huskies net at 16:18, but the Cougars couldn't get the one they needed in the end as Saskatchewan emerged victorious in the 4-3 victory. Hendricks made 28 saves in the victory while Kish stopped 25 shots while coming up short. Saskatchewan gained a 1-0 advantage in the series. REGINA at SASKATCHEWAN: Regina would have last change in this game, and they needed a win to keep their season going. Saskatchewan would be the road team on home ice, and they were looking to close out this series. Both teams had their chances early on, but it was a goal late in the period that would put the Huskies up 1-0. Bailee Bourassa's shot from the right face-off circle found a path through traffic and Jane Kish to dent twine at 17:51 to put pressure on the Cougars. The second period was more defensive in nature, but the chances that were generated were stopped at both ends so we'd be forced to move to the final 20 minutes of regulation with the Huskies still leading 1-0. Midway through the third period, Kylee Kupper's shot was stopped by Cassidy Hendricks, but the rebound came out on her stick-side and Jolene Kirkpatrick was there to bang home the loose puck at 9:33 to get the Cougars on the board and tie the game at 1-1! It would be a mistake and a turnover in the neutral zone that would lead to the next goal as Kori Herner picked up the mishandled puck, broke into the zone, and fed Kaitlin Willoughby for the shot on Kish that pinged in off the post at 16:25 to put Saskatchewan back up by a 2-1 count. Desperation set in quickly for Regina as they needed a goal badly. Kish was on the bench with nearly three minutes to play, and a late power-play for the Cougars had everyone on the edges of their seats, but the final horn would end this game with no further scoring as the Saskatchewan Huskies survived the late pressure by the Cougars to win the game 2-1 and sweep the series by a 2-0 count. Hendricks stopped 31 shots in helping her team advance while Kish made 21 saves as the Cougars' season comes to an end. MOUNT ROYAL at MANITOBA: The sixth-place Mount Royal Cougars traveled east to visit the third-place Manitoba Bisons for a battle to determine who would advance to play either the Thunderbirds or the Pandas. This game started off quickly as both teams pressed early in trying to force a mistake by their opposition. It would be Mount Royal who flinched first as a failed clearing attempt up the boards was corralled by Caitlyn Fyten, and her slapshot after changing the shooting lane was deflected perfectly by Venla Hovi past Emma Pincott at 2:55 to put Manitoba up 1-0 early. Even with the furious pace, the two teams couldn't find the net again in the first period as Manitoba took the lead into the intermission. The battle continued in the second period, and Mount Royal would finally solve Rachel Dyck on the power-play. Gabrielle Seper cut into the Bisons zone and received pass from Sarah Weninger before throwing a low shot on net that eluded Rachel Dyck's outstreched left leg and somehow found the inside of the far post to even the game at 1-1 at the 10:57 mark. The Cougars actually took control of this game for a portion of the period after the goal, but it would be a veteran who changed the tides of momentum. Manitoba's Karissa Kirkup pulled off an incredible individual effort as she chipped the puck past her check, put the puck on her backhand, skated into the slot, and went top-shelf with the backhander past Pincott at 16:47 to score one of the prettiest goal this season in giving the Bisons the 2-1 lead! The two teams went back and forth at the start of the third period, and it would Kirkup who would strike at the midway point of the frame. She carried the puck into the Cougars zone, stopped in the face-off circle, and ripped a shot through Pincott at 10:12 to put the Bisons up 3-1. Five minutes after that, the Bisons were killing penalty when Alanna Sharman forced a turnover at the point and led a two-on-one the other way. Her feed over to Nicole Carswell was perfect as Carswell poked the puck between Pincott's legs for the shorthanded goal and the 4-1 lead at 15:13. Alex Anderson would tee up a point shot at 18:47 that appeared to change direction to elude Pincott with 1:13 to play, and that would be more than enough for Rachel Dyck to close this game out as the Bisons win 5-1 and go up 1-0 in the series. Dyck stopped 26 shots in the win while Pincott turned away 20 shots in the loss. MOUNT ROYAL at MANITOBA: Game Two of this series saw the Cougars shift to the home team while the Bisons, playing on home ice, would be the road team. This would give the Cougars the last change, and they would use that advantage to match lines and get key players on the ice in specific situations. Quite literally, Mount Royal played a perfect road game despite being the home team in clogging up the neutral zone so Manitoba couldn't attack with speed and keeping the Bisons on the outside when they did gain the offensive zone. Through 40 minutes, the Cougars and Bisons played scoreless hockey with a few chances, but both Rachel Dyck and Zoe DeBeauville were flawless in their netminding. However, the third period saw the scoreless draw snapped as the Bisons' third line made their presence felt. Caitlyn Fyten cleared her zone with a perfect bank pass off the boards to Erin Kucheravy who evaded a defender at the blue line and broke down the left-wing wall. She threw a centering pass across the ice where Alana Serhan, who had a step on her check, reached out and redirected the puck past Zoe DeBeauville whose sliding save wasn't quite stretched far enough to stop Serhan at the 8:18 mark. With the Bisons leading 1-0, the Cougars began to throw everything they could at Rachel Dyck. Late in the game, the Bisons were down two women due to penalties and head coach Scott Rivett pulled DeBeauville for a six-on-three advantage. Blocked shots, big saves, and desperate clears kept Manitoba in the lead until the final horn sounded as the Bisons survived Game Two by a 1-0 score to win the series 2-0 and move on. Dyck was perfect on all 12 shots for the shutout win while DeBeauville was outstanding in making 15 stops in her final game this season. The top-four teams in Canada West women's hockey will play in the semi-final series as the Saskatchewan Huskies will travel west to Vancouver and play the UBC Thunderbirds in that best-of-three series while the Manitoba Bisons will head northwest to Edmonton to visit the Alberta Pandas for a best-of-three series. UBC and Saskatchewan were 2-1-1-0 this season against each other with the teams splitting the two-game series in Vancouver in early October. Obviously, things have changed since then, but Saskatchewan is the only team in Canada West to have defeated UBC twice this season. That could be important as the two teams were similar in their defensive play - UBC had 45 goals-against while Saskatchewan had 52 goals-against. UBC, however, scored 30 more goals than Saskatchewan did this season, so we'll have to see if UBC can get that potent offence running. If I were a betting man, I think this series goes three games with UBC prevailing. The other series is decidedly in one team's favor. Alberta has had Manitoba's number all season in going 3-0-1-0 against the Bisons. Three of the four games, though, were one-goal decisions, so there may be something to build on if you're a Bisons fan. Both teams had similar positive goal differentials, so they question of scoring and stopping goals shouldn't be an issue. It's just a matter of who can stop more pucks, and right now the Pandas have that advantage on paper. If we learned one thing from this Manitoba team, though, it's that they can play on the road and win a series in Edmonton as they did last season. I'm going to bet against common sense here to say that Manitoba wins this series in three games. These two series should be exciting and fun to watch, so find a way to get to the rinks or tune in via Canada West TV. It might be some of the best, most spirited hockey you see all season as neither team in either series likes one another! 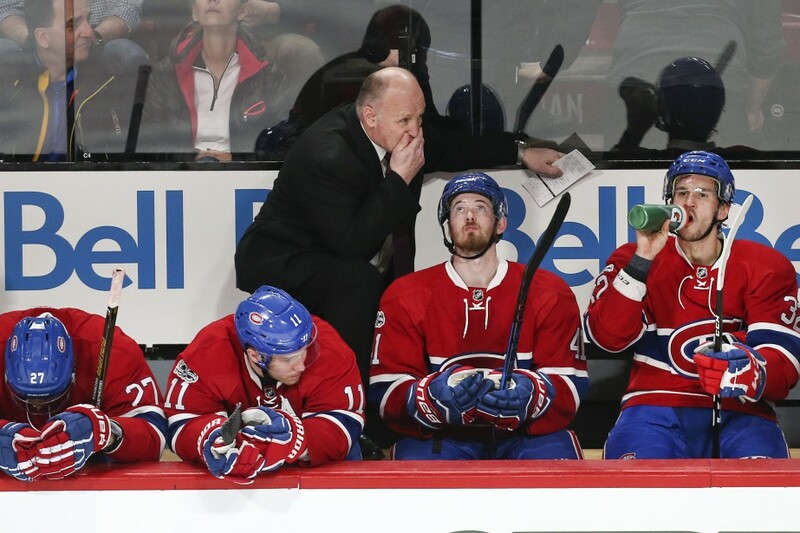 Claude Julien was back in the NHL today with his new team as the Montreal Canadiens hosted the Winnipeg Jets. Julien has had one full practice with his team thus far so I don't expect the Canadiens to pull out of their floundering ways, but a coaching change usually puts a little jump into each player's step as they try to impress the new coach. There's a big difference between a .500 Canadiens team in 2003 and a division-leading team in 2017, but in watching this Canadiens team it is clear they need a different voice. I don't know if Julien can stop the flat-lining that this team seems to be going through, but watching them today against the Jets was like watching a team in disarray. They started strong, but they looked awful by the end of the game. Shea Weber doesn't look anything like his normal, dominant self. Gallagher, Pacioretty, Galchenyuk, and Radulov seem to be going through the motions when it comes to generating offence, and Carey Price isn't getting a lot of help from the rest of the defence. In short, this team looks a lot like a Michel Therrien team after a number of years. The one thing that Julien will do is bring accountability to his players just as he demanded in Boston of his players there. No one will get a free ride when it comes to hard work, puck battles, and races to loose pucks. That's just how it is with Julien. If you don't like it as a player, you might as well have La-Z-Boy drop off a recliner in the press box because Julien will have none of it. In saying this, players like Shaw and Gallagher will be given more responsibility when it comes to their pest-like play, but they'll still be expected to contribute much in the same vein that Brad Marchand was allowed to evolve in Boston's system. Shaw's penchant for temper tantrums and suspensions won't be tolerated by Julien, but it will be expected that he plays tough-as-nails on the opposition. Gallagher will still get his minutes, but he can't rest on the fact that he's a non-scoring pest. He'll need to bring some offence in Julien's systems. As of right now, I'd say that David Desharnais, Alexei Emelin, and Torrey Mitchell are fighting for their jobs. All three are underperforming based on what Julien will need out of them, and that's not good. If these three cannot find some sort of effective role within Julien's system, I can see all three being dangled as trade bait when the trade deadline rolls around this year. Overall, the changes will come. Julien will make the Canadiens a better squad overall, but one practice won't do much as we saw today. Julien started his Montreal coaching gig in 2003 with three wins and two ties in five games, but his second stint started with a lifeless 3-1 loss to the Jets. Expect that to change before the end of the month. If it doesn't, the personnel will change. While we only got to interview one of these two broadcasting legends, the day yesterday in Kenora was nothing short of magical. Whether it be visiting the world famous chip truck to seeing a number of NHL legends on the ice, the town of Kenora put on one heckuvan event on Thursday, and we still have two days of festivities to go! None of us from The Hockey Show really wanted to pack up and head home on Friday, but other duties called and we needed to get back home. However, today is all about why hockey needs to return to its roots when it comes to events like this as Kenora, Ontario may have hosted the best Thursday of a Hockey Day in Canada event ever! As one reaches the Ontario border from the Manitoba side, it feels like one has been transported from fields of green to lakes of blue, especially on this warm Thursday. The winding highway through lake country is surround by faces of rock and small cliffs thanks to the Canadian shield, making the drive to Kenora feel more like a trip through a small, picturesque mountain range. But as one nears Kenora on Highway 17, it becomes apparently clear why this is cottage country as the lakes take over the landscape. Kenora itself isn't a huge city by any means. The town boasts about 15,000 people as its populace, but that number can swell to double the size in summer as thousands flock to the area for boating, fishing, and cottage life. I expected a quiet town on Thursday as I pulled into the city, but what I expected was far different than what I found. The city had not only embraced Hockey Day in Canada, but personified it in every way. From billboards welcoming people to Scotiabank Hockey Day in Canada to every shop and store in town having a Hockey Day in Canada logo in its windows to jerseys of every team and every generation of Kenora Thistles hockey, Kenora was living and breathing the game of hockey with every foot I went deeper into town. My first stop was the Kenora Recreation Centre which houses the Kenora Thistles Rink and the Kenora Aquatic Centre. The rink can be described as a modernized "old barn" as it still has the feel of an old-time rink, but has a number of modern amenities that allow it to host all sorts of events. Located at 18 Mike Richards Way in the city, the 1900-seat facility plays host to the vast majority of hockey events in and around the Kenora area including high school and AAA hockey games. My arrival coincided with meeting Bob, an amazing man who runs the merchandise stand in the rink. Bob is a lively gentleman who loves his hockey almost as much as he's proud of his city, and his knowledge of the history of the Kenora Hall of Fame players is second-to-none. He and I must have spoken for an hour about all the history and great players who have grown up in the Kenora area, and his knowledge on the Thistles teams from the Stanley Cup-winning squad through to today was a lesson in hockey history I'll find nowhere else. Bob is a gem of a human being, and I highly recommend stopping by the merchandise stand if and when you visit Kenora. The next person I met was a young lady by the name of Casey who was in charge of all things happening at the rink. If I had a question, she had the answer. To call her a resource would be doing her an injustice because she's quite literally the lifeblood of the Rec Centre. She was on the go the entire time I was there, but had time to stop for every question, every fan, and every visitor to ensure that they were doing well. I don't know what she's earning in her role, but I'm quite certain she's worth double the amount with how vital she was during the day in my time at the arena. She's everything that one could hope for in an ambassador, and that only scratches the surface of what I saw from her. Bob caught me again, and this time he had guests to introduce. Bob introduced me to Len "Kroppy" Kropioski's niece and her husband. Kroppy, as you may be aware, is a legend in Winnipeg thanks to his unwavering support of the Winnipeg Jets who he would drive in to see for each and every home game from his hometown of Kenora. This couple were two of the nicest people one could ever hope to meet, and I feel blessed having met them. 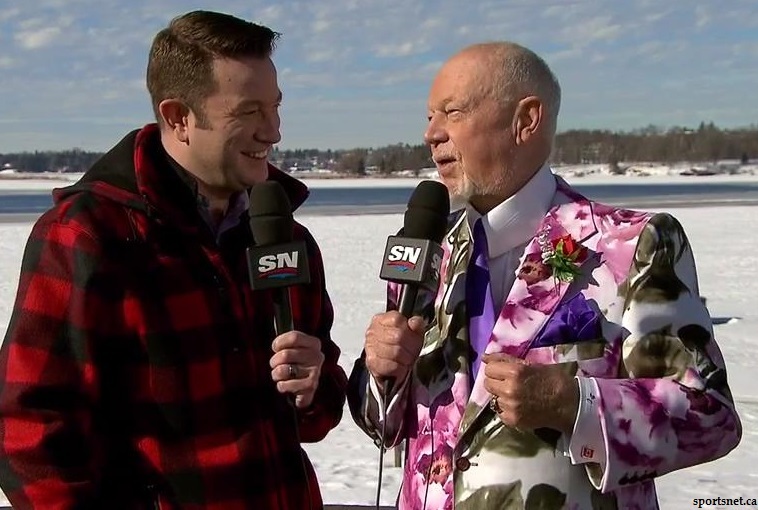 From there, I was able to speak with Sportsnet's Ken Reid, pictured in what he called a "Kenora Dinner Jacket" above, for about ten minutes prior to the Skate with Stanley event happening at the Kenora Rec Centre. I also got a nice nod and smile from Hall of Fame legend Bryan Trottier after I said hi to him. He was also there for the Skate with Stanley. Mark Napier was late and blew by me as he rushed to get his skates on, but he blurted out as he entered the arena, "Man, look at this great old rink. I love it!" Clearly, the appeal of the Rec Centre was not lost on the NHL legends. I ran around a little in the afternoon as I picked up a few groceries and checked into my hotel room. In both the grocery store and the hotel, every staff member was wearing a Hockey Day in Canada or Kenora Thistles shirt! While the hotel staff is managed by an independent owner who certainly can approve this choice of uniform, the national grocery store chain I visited has an approved uniform. However, it appeared management was entirely in the spirit and had their staff in the spirit as well as they all were in hockey gear! Upon returning to the Kenora Rec Centre, I went about getting the radio broadcast set up. Lots of people using the concourse walking/running track stopped by the table I was getting set up on to ask what I was up to and pass on stories about their meetings with NHL legends and local hockey heroes. I can't express how incredible this interaction was as people literally were brimming with excitement in being able to tell someone that they met their favorite hockey players. I thoroughly enjoyed seeing their excitement and listened enthusiastically as they told their stories. The show, if you listened, went off without a hitch as we chatted hockey and had some laughs. The women's hockey game that went on while we went to air between Beaver Brae Secondary School and St. Thomas Aquinas was nothing short of epic as they took a 4-4 tie into the shootout where there played about 30 rounds of the shootout before St. Thomas finally prevailed. Ok, maybe 30 isn't entirely accurate, but we watched a number of shooters score and be denied before a final goal caused a massive celebration on the ice. Honestly, it was one of the best women's high school hockey games I've ever watched. We were fortunate to feature Mr. Ken Reid on the show as well, and that man is a professional. Ken was gracious enough to spend about an hour with us as he told stories of new books, his time on Sportsnet and working his way up to that illustrious position, and he had some great views on some of the topics we covered on The Hockey Show. He knows his hockey, he's well-versed in broadcasting, and he was a delightful guest. Ken Reid is truly one of the best men in the business! I also need to give thanks to a number of people as we wouldn't have had this experience without them. First and foremost, Joel Darling of Sportsnet was incredible to speak with when it came to granting us this opportunity. He understood the importance of this broadcast and made it clear that we were to cover the game with the utmost professionalism, but he also was quick to remind me that it was about having fun. I hope we made you proud with our broadcast of the NHL/Kenora alumni game, Mr. Darling. I would not hesitate to jump at the opportunity if you asked us to work with you again. Thank you, Mr. Darling. I also want to thank Bruce Johnson, Thistle Alumni Coordinator, for allowing us to set up in our broadcasting location for the game. Bruce was vital in getting a pile of Thistles alumni to play in the game, and he was the man in charge of the game's progress once the seats were filled. He allowed me to stand between the benches for a unique perspective on the game while allowing TJ and Beans to broadcast from the concourse at center ice. Bruce was a gentleman, a professional, and he ran a tight ship. The alumni game wouldn't have been possible with his efforts. Thank you, Mr. Johnson. Lastly, but in no way least in any way, I want thoroughly thank Miss Kerri Holder, Communications Clerk for the City of Kenora, for being my point of contact in getting me in touch with Mr. Darling, Casey, and Bruce. She was vital to UMFM's experience in Kenora despite her being incredibly busy on Thursday. I cannot express how much gratitude for her efforts in getting our little show down to Kenora to be part of the festivities, but she absolutely deserves the recognition. Thank you, Miss Holder, for everything you did to help us. Of course, this event would have been nothing if not for the people of Kenora, and I want to thank them as a group. My time in Kenora barely spanned 24 hours, but the warmth and welcoming nature of the town was more than I ever expected for some little radio broadcaster. Thank you, Kenora. I love visiting, and you're going to be exceptional hosts for the entire country on Saturday for Scotiabank Hockey Day in Canada. You may have heard us on The Hockey Show during the World Junior Championship wrap-up talking about how the smaller communities live and breathe junior hockey when it comes to their towns. Kenora is a shining example of an entire city embracing their moment in the spotlight and running with it. While personalities such as Ron MacLean, Don Cherry, Darcy Tucker, and Lanny McDonald visit, the star of this weekend will be the city and citizens of Kenora because of how they are embracing the event. We implored the World Junior Championship to return to its roots where hockey is a part of the culture and brings people together from all walks of life at all hours of the day in every season. Kenora is the embodiment of this plea from our show, and its citizens are exceptional ambassadors of this wish. Look to the communities where hockey's stars found their path, and you'll find the passion for this game once more. Hockey is still a game. In the end, it shouldn't be about record-breaking profits or the most-attended event in the game's history. It's always been about the love of the game, and I think I saw my passion re-ignited in Kenora thanks to its citizens' outpouring of passion for the game. I'm proud to have been a part of this event and to have had the privilege of working with some exceptional people. But the real stars of Scotiabank Hockey Day in Canada are the City of Kenora, its citizens, and the memories made as a result of these important pieces. Thank you, Kenora. It's an experience I will not soon forget. The Hockey Show, Canada's only campus-produced hockey radio show, is on the road today as we broadcast from an entirely different province! Your humble hockey program is out east as we invade the city of Kenora as part of Scotiabank Hockey Day in Canada this weekend! We are beyond excited to bring you the show - and more! - from the city of Kenora as we get ready for a fun-filled, action-packed day that will expand beyond the borders of our one-hour timeslot! You're going to want to be near an internet-enabled device today because The Hockey Show is going mainstream! We are honoured and humbled to be welcomed to the city of Kenora to participate in Scotiabank Hockey Day in Canada. It isn't often that a show like ours is invited to play on the big stage, but, like any call-up from the minor leagues, we're gonna give it everything we have under the bright lights! Tonight, we'll bring you our normal crazy hockey chatter that will include discussion about Claude Julien being hired by the Montreal Canadiens, Gustav Nyquist's and Antoine Vermette's indiscretions, did Alex Chiasson's spear deserve a major and a game misconduct, the passing of Mike Ilitch, and we'll go over all your Scotiabank Hockey Day in Canada events happening in and around the Kenora area! But we're only getting started, folks. If you tune in on the UMFM Second Stream found on the UMFM webpage at 5pm, I'll be running down some exclusive content from the events happening earlier in the day in Kenora, and we'll carry past the 6:30pm mark on the Second Stream as Sportsnet's Ken Reid joins us for a quick chat prior to the NHL/Kenora hockey alumni game happening at the Kenora Rec Centre tonight! Ken has had a storied career as the pride of Pictou, Nova Scotia, and we'll chat with him about his time on the anchor desk at Sportsnet as well as being an accomplished author! At 7:30pm on UMFM's Second Stream, we will bring you the first-ever broadcast of an NHL alumni game on UMFM as names like Lanny McDonald, Darcy Tucker, Mark Napier, and Carey Wilson suit up against Kenora hockey alumni such as Mike Richards and Rick St. Croix! Joining the alumni teams will be distinguished guests such as Jets owner Mark Chipman, Hockey Night in Canada's Ron MacLean and Scott Oake, and Sportsnet's Ken Reid. Rounding out the alumni will be local Kenora hockey alumni, and we'll be bringing you all the action from the Kenora Rec Centre as the two teams have a little fun on the ice prior to Scotiabank Hockey Day in Canada kicking off on Saturday! You'll be able to tune in to the show tonight by downloading the UMFM app! Like now. It's the easiest and most convenient way to listen to any of UMFM's great shows, so go get it! Just follow this link on your iDevice or this link for your Android device and get the UMFM app! It's never been easier to tune into The Hockey Show or UMFM! Download the UMFM app today! I'm going to be all over social media today, so follow as you see fit! Email all show questions and comments to hockeyshow@umfm.com! Tweet me anytime with questions you may have by hitting me up at @TeebzHBIC on Twitter. You can also post some stuff to Facebook if you use the "Like" feature, and I always have crazy stuff posted there that doesn't make it to the blog or show. Make sure you hit UMFM's Second Stream found on the UMFM webpage to get access to all the action tonight, and join us for the NHL/Kenora hockey alumni game as part of Scotiabank Hockey Day in Canada live from the city of Kenora, Ontario! It's going to be a big day for The Hockey Show on 101.5 UMFM, on the UMFM app, and on UMFM's Second Stream! 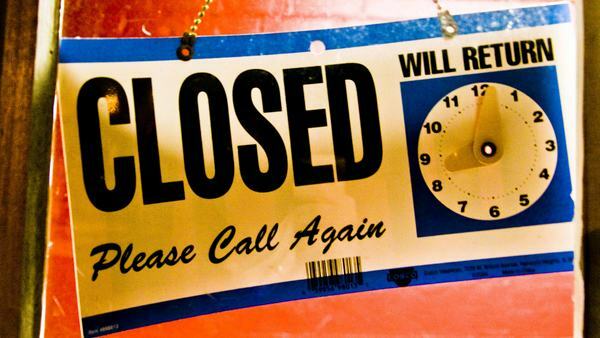 HBIC will be closed today. I hope you don't mind. I know there has been a ton of hockey stuff happening - Claude Julien becoming the head coach of the Montreal Canadiens, Michel Therrien cut loose for the second time, Gustav Nyquist's vicious high-stick on Jared Spurgeon - but there are even bigger things afoot here at the ol' blog. 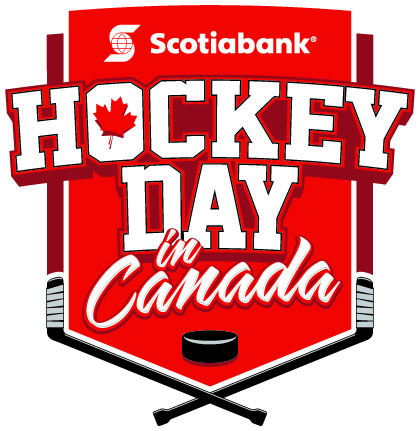 As you might be aware, the radio show is on the road tomorrow as we invade Kenora, Ontario as part of Scotiabank Hockey Day in Canada! This is a huge opportunity for UMFM and The Hockey Show, so I'm closing up shop for the day in preparation of my journey east! We'll discuss the topics above on the show tomorrow that will air live from the Kenora Recreation Centre, the 1900-seat facility that houses all the big hockey games in the Lake of the Woods region. We'll be on the air a little earlier than normal, but we'll be running an extra-long broadcast on the UMFM Second Stream all night long. Staring at 5pm, we'll be on the air talking all things hockey in Kenora, we'll have our normal show time from 5:30 to 6:30 on both the Second Stream and on UMFM's airwaves, and we'll stick around after the show to continue to talk hockey with a special guest as we lead up to the premiere broadcast of the NHL/Kenora hockey alumni game live from Kenora! Honestly, this is one of the biggest things we've ever done on our show by a large margin, and I'm pretty sure it's a first for the radio station in having their presence at a major hockey event like the NHL alumni game. There are some people that I feel the need to thank before we get out there, so let me take a moment to do that. First off, I cannot say thank you enough to Bruce Johnson and Kerri Holder who live in Kenora. Bruce is the man who organized the NHL/Kenora hockey alumni including getting a number of the players from the local community to unretire for one night and come back and play in the big game. Kerri is the lady who is coordinating all the media releases and put us in touch with the powers-that-be when it comes to the broadcasting rights. Without these two, I don't think adventure would have gotten off the ground, and I want to thank them immensely for giving us a shot at joining the fun tomorrow. Secondly, I think a big thank you needs to go out to Rogers Sportsnet and, in particular, Joel Darling, Executive Producer of NHL Special Events for Rogers Sportsnet Hockey. Mr. Darling and I had a great conversation abut the event, and he graciously allowed us the opportunity to broadcast the game to the world. We are forever indebted to Mr. Darling for this opportunity as well, and we're going to give this broadcast a professional touch in every sense of the word. In saying all this, I have some stuff to do tonight in getting ready for tomorrow's adventure, so HBIC is calling it a day today. 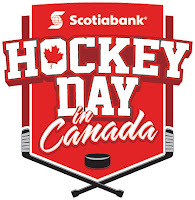 Kenora, Ontario is the destination tomorrow, and HBIC and The Hockey Show are going to bring the fun we have to the celebration they are throwing as we join Scotiabank Hockey Day in Canada for one evening! With five games remaining on their schedule, the Aalborg Pirates of Denmark's Metal Ligaen are still playing meaningful games into February. That's not to say that head coach Brandon Reid doesn't have them focused on the goal as the Pirates appear to be on the verge of entering the Metal Ligaen's postseason as the top-ranked team in the ten-team circuit after finishing last season below .500 and in eighth-place. To say that Brandon has turned this team around in one season with a few key additions would be an understatement, but it goes to show that Reid's efforts in becoming an effective communicator and coach from his past coaching stints have paid off for the city of 112,000 people! Aalborg isn't quite out of the woods yet when it comes to securing top spot in the Metal Ligaen, but they're very close. The Odense Bulldogs are right on their heels followed by the Frederikshavn White Hawks. Odense beat Sonderjyske Ishockey earlier today by a 4-2 score, so Aalborg will need a win against Rungsted tomorrow to stay atop the standings. Needless to say, the race is on for first place. In 2015-16, Aalborg finished the season 14-24-3-4 for 52 points and eighth-place in the league. They were a quick four-and-out in the playoffs at the hands of Sonderjyske who finished 41 points ahead of the Pirates as the top team in the league. Flash forward to today, and the Pirates are on pace for a 90-point season buoyed largely by the systems and teachings of Brandon Reid and the recruits he brought in to help play his system. One of those recruits was former Brandon Wheat King Peter Quenneville who has torn up the league in the second-half of the season. Quenneville is a goal back for top goal-scorer in the league, and there's no sign of him slowing. The Edmonton, Alberta native and former seventh-round pick of the Columbus Blue Jackets played with the ECHL's Cincinnati Cyclones in 2015-16 where he had 11 goals and 15 assists in 58 games, but the sniper has rediscovered his goal-scoring touch in Denmark where it appears he may hit 30-or-more goals for the season. Quenneville currently leads the league in shots, and is near the top of the game-winning goal category as well. Needless to say, the addition of this piece was one of Reid's best moves in helping Aalborg get to where they are now. However, the systems that Reid has put in place have also dramatically changed the way the team plays the game. In 2015-16, Aalborg was -45 in goal differential during the season on the strength of 129 goals-for versus 174 goals-against which, in part, led them to that eighth-place finish. Today, the team has a goal differential of +29 on the strength of 112 goals-for versus 85 goals-against - nearly half as many goals-against as one year ago. It's not that they're scoring a ton more goals; rather, it's simply because the defensive system is better, and that points directly to Brandon Reid and the coaching staff in getting the players to execute the game plan. The best finish this team has had was in their initial season of 2013-14 after they were founded exclusively as an Aalborg team. They finished third that year with a 23-12-2-3 record, and it appears that franchise-best mark will be eclipsed this year by a large margin. The last two seasons were eighth-place finishes that saw Aalborg win a total of one playoff game. I have a feeling this season will see those memories erased as well. It's amazing to think that Brandon has gone from coaching Vojens to working with the Canadian national sledge hockey team to becoming the head coach back in Denmark with Aalborg. I'm happy to see he and Jessica, his wife, doing so well, and to see the newest addition to the Reid family, baby daughter Clover, getting bigger by the day. He's already signed an extension to stay in Aalborg next season, and that might be the best move this club has ever made. Brandon Reid is humble enough to say that it still takes a team to execute the game plan and systems, but it was he who put those systems and game plans in place day-in and day-out. The dramatic turnaround started in the summer before he arrived in Denmark where phone calls and visits to players he wanted on his team were made. While Brandon is entirely right that it DOES take a team to execute the game plan, the foundation for this season was being laid before any of the players pulled on a jersey or stepped on the ice. That credit goes entirely to Brandon Reid. Goal Of The Year Candidate?